Inglewood’s reception extends a welcome to anyone wishing to obtain an introduction to Dianetics and Scientology. We are open morning to night, seven days a week. The Public Information Center offers some 500 films, providing a complete introduction to every aspect of Dianetics and Scientology—including the beliefs and practices of the religion and the many humanitarian and community outreach programs Churches sponsor over the world. Here, too, are biographical displays on the life and legacy of our Founder, L. Ron Hubbard. Visitors are welcome to peruse the displays at their leisure, as long as they wish and to come back as often as they like. The Chapel, lined with the Codes and Creed of the Church, provides for our congregational ceremonies, and services—including Sunday Services, Weddings and Naming Ceremonies. The Chapel further serves as a venue for weekly graduations, as well as lectures, workshops and a host of community events. A full wing of our Church is devoted to Dianetics and Scientology Introductory Services. These include the array of Life Improvement Courses that empower anyone with the tools to improve any aspect of life: relationships and personal integrity; marriage and the raising of children; and effective time management and principles of prosperity. Further study course rooms provide for the Success through Communication, as well as evening and weekend seminars. L. Ron Hubbard developed the Purification Program to free individuals from the mental and spiritual damage caused by drugs and toxins. The Purification Center contains two saunas, in addition to exercise facilities used on the Program. The Center’s mural pays homage to Inglewood’s cultural heritage. The Hubbard Guidance Center (HGC) is where Scientologists receive one-on-one spiritual counseling, known as auditing. Our HGC includes 20 auditing rooms, each one ideally appointed to provide the calm, distraction-free setting necessary to achieve spiritual enlightenment. The Academy is where Scientologists study an array of courses to train as Scientology auditors (spiritual counselors), capable of applying the technology of auditing to help others attain spiritual freedom. The Inglewood Academy comprises six course rooms, each devoted to a different aspect of training and altogether seating up to 200 students at a time. The bookstore contains all of L. Ron Hubbard’s books, audiobooks and lectures on Dianetics and Scientology. Standing at its center is a Materials Guide Chart, providing an informational overview of every book and lecture and the subjects contained within each. An audiovisual listening system further allows one to view illustrated video presentations of L. Ron Hubbard’s recorded lectures. As is traditional in all Churches of Scientology, an Office of L. Ron Hubbard stands in honor of our Founder and symbolizes that this Church is true to his writings and ideals. Our new Community Center stands on Vermont Avenue and 81st Street in a now fully restored historic art deco landmark. Welcome to our new Church. Its establishment, along with the opening of our new Community Center at Vermont Avenue and 81st Street, marks the beginning of a new era. For although Scientology parishioners have been actively involved in these neighborhoods for decades, it is now our privilege to be able to serve the whole of the community on an entirely new scale. 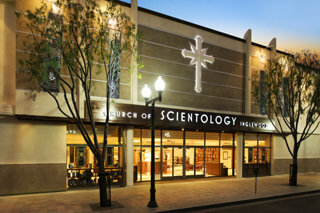 This new Church realizes Scientology Founder L. Ron Hubbard’s vision that all Churches of Scientology become what he termed Ideal Organizations (Orgs). 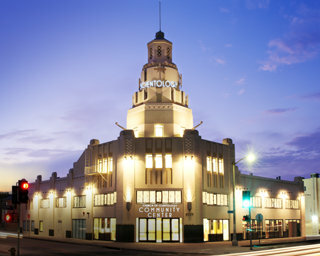 Ideal Orgs not only provide the ideal facilities to service Scientologists on their ascent to higher states of spiritual awareness and freedom, but they are also designed to serve as a home for the whole community and a meeting ground of cooperative effort to uplift people of all denominations. To that end, we offer our many humanitarian and social betterment programs to Inglewood and South Los Angeles and look forward to working together with those who share our common goals for a drug-free, crime-free and thriving future. The centerpiece of our Center is the L. Ron Hubbard Community Auditorium, a 380-seat facility to provide for event gatherings of every type and as a meeting ground for all. In that respect, it is a venue dedicated to community-wide humanitarian initiatives in the spirit of our Founder’s vision of all church denominations working together to achieve the common dream of all religions. The Center further features course rooms and seminar facilities for a full range of civic programs, as well as a complete literacy and tutoring center. 5,000 Scientologists, guests and city officials gathered Saturday November 5, for the dedication of an entirely new Church of Scientology and Church of Scientology Community Center. The Church stands in the heart of downtown, at 315 South Market Street, and reflects the growth of a new Scientology congregation amongst these communities.